Speed traps are the bane of motorists everywhere. You're just driving along, minding your own business, and then you see those cherries and berries flashing in your rear view mirror. Sometimes you get let off with a warning, but sometimes you end up with a ticket, and points on your license. (1) A particular section of a highway measured as to distance and with boundaries marked, designated, or otherwise determined in order that the speed of a vehicle may be calculated by securing the time it takes the vehicle to travel the known distance. (2) A particular section of a highway with a prima facie speed limit that is provided by this code or by local ordinance under paragraph (1) of subdivision (b) of Section 22352, or established under Section 22354, 22357, 22358, or 22358.3, if that prima facie speed limit is not justified by an engineering and traffic survey conducted within five years prior to the date of the alleged violation, and enforcement of the speed limit involves the use of radar or any other electronic device that measures the speed of moving objects. This paragraph does not apply to a local street, road, or school zone. The obvious way to avoid these traps is to just drive safely, and obey the speed limit at all times. However, there are other steps you can take, as well. First, it's important for anyone who gets behind the wheel to know what the definition of a speed trap is. 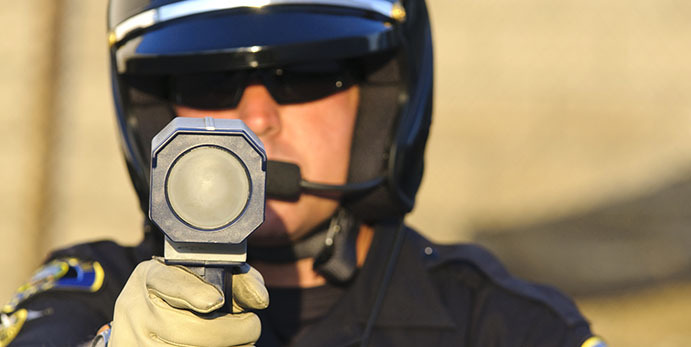 A speed trap is not a police car parked behind a billboard, waiting for you to drive by to clock you going too fast. Because if the speed limit is clearly posted, then whether you saw the cop or not when you were speeding doesn't matter. No, an actual speed trap is when something genuinely illegal is happening. For example, if a stretch of road has a poorly posted speed limit that's different from other parts of that road, then that is a speed trap. It is the government's responsibility to clearly mark changes in the speed limit so drivers can respond accordingly. It is also the government's responsibility to make sure those changes in speed limit are backed up by research from the highway department stating the change is necessary, which ensures no one is randomly creating places to trap motorists as they speed. One of the easiest ways to find, and deal with, speed traps is to download an app that updates you about their existence. The mobile app Waze, for example, is primarily a GPS program, but it also provides information about speed traps on your route. This information is invaluable, and if all you want to do is avoid getting caught in a speed trap, then this is pretty much all you have to do. While the app isn't infallible, it is regularly updated to be sure you don't get caught off guard. If you want to take bigger steps to fix speed traps, though, then you're going to have to roll up your sleeves and get political, according to Motorists. In order for a change in speed limit on a given stretch of road to be legal, it must be backed-up by a survey done by the highway department in the past five years. If you suspect this isn't the case, then you need to contact the department, and request the study in question for that particular speed trap. If it doesn't exist, you need to file a complaint that a speed trap has been created, and is being illegally exploited to capture motorists in order to fine them. You'll need to check and re-check on your complaint, as well, and if you know other people who've been caught in that speed trap, then you need to get them to register complaints, too. Involving the media, and possibly taking legal action, may also be necessary at some point. Speed traps are a problem, especially when you consider that motorists' fines go straight into the government's coffers in some way, shape, or form. Avoiding these traps is fairly simple, thanks to today's technology and the speed at which communication happens. Changing them, though, and ensuring that motorists don't have to constantly look over their shoulder, that is a much more difficult process. But it can be done, if enough citizens band together, and refuse to be silent about what's happening.